Thank you for registering to receive DEEPSEA CHALLENGE updates. We will send regular updates as the expedition progresses. 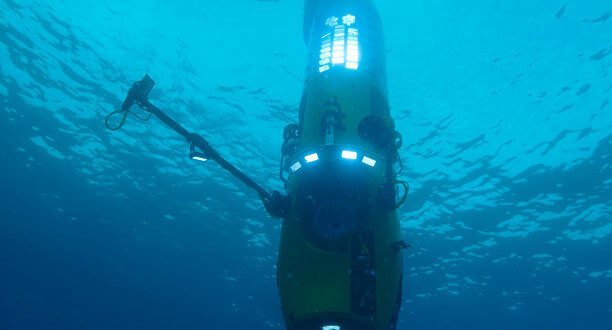 The DEEPSEA CHALLENGER is equipped with power for its lights, thrusters, and cameras, but James Cameron didn’t need fuel or batteries or any kind of man-made power to descend to the deepest point on the ocean floor. All it took was simple gravity. About 1,100 pounds (500 kilograms) of weights pulled the submersible nearly 7 miles (11 kilometers) down. To return to the surface, he’ll drop the weights, and another simple force will take over: buoyancy. 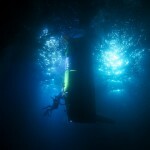 Without the weights, the sub is lighter than water. James Cameron has descended nearly 7 miles (11 kilometers) to the bottom of the ocean—that’s about how high you might fly during a commercial flight. But his ears aren’t popping. That’s because the pressure inside his small, spherical chamber is kept constant. James Cameron may be diving to the greatest depths of the ocean, but he’ll never actually touch the saltwater himself. He entered the sub on the deck of the Mermaid Sapphire, the expedition’s ship. In preparation for the dive, Cameron was bolted inside the sub, which was then lifted by crane off the ship’s deck and into the water. Divers positioned the sub in the water using float bags, and removed the bags when it was time for the drop. When he returns to the surface, the crane will pluck the sub out of the water and he’ll climb out onto the deck. Filed under Inside the Expedition and tagged sub. On March 26, 2012, National Geographic Explorer James Cameron made a record-breaking solo dive to the Earth’s deepest point. 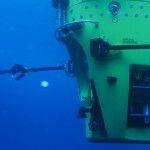 DEEPSEA CHALLENGE is now in its second phase—scientific analysis of the expedition’s findings. © 2019 DEEPSEA CHALLENGE, National Geographic. All rights reserved.